Quick Take: Eastbound and Down, "Chapter 7"
Review: Eastbound and Down, "Chapter 7"
(S0201) Of course Kenny Powers would become something of a crime boss in his first few weeks in Mexico. It makes too much sense. He's always been something of a Michael Corleone-type, trapped in the body (albeit a horribly out-of-shape body) of a baseball player. In the U.S., he was forced to play by the rules. In Mexico, there are no rules. At least in Kenny's mind anyway. And Kenny's perspective is and has always been the device that frames the world around him, even if it's not an accurate portrayal of real life. While hiding out from his demons, he becomes a cockfighter not as a means of survival, but because it's what he thinks is the logical profession for a man hiding from his demons in Mexico. His voiceover (now coming in the form of a new memoir he is "writing") describes Mexico as a wilderness, even though the Copales we see see seems pretty modern. But Kenny (Danny McBride) is beefing up his own tale, even if the only person he has to impress is himself. This defense mechanism has been known to backfire quite often, but no more so than when he ran away from North Carolina in the first place. When Adam Scott's slimy Tampa Bay Rays "executive" showed up and promised Kenny a spot on the major league roster, Kenny used it as an excuse to act like the town's prodigal son, leaving to make them all proud and taking April (Katy Mixon) with him. The deal falls through, however, and all of Kenny's build-up is too towering for him to come back down to earth. So he leaves April at a gas station and leaves his dignity in the States. Down in Copales, he teams up with two comically mismatched sidekicks -- the diminutive Aaron (Deep Roy) and Hector (or as Kenny calls him: "Of Mice and Men") -- and starts dominating the cockfighting circuit, though not without taking in the occasional game of the local baseball team, the Charros. The Charros' manager notices Kenny in the stands and approaches him about possibly joining the team, but Kenny dismisses this. That is, until his prized rooster is killed in a match (and let me say, the cockfighting scenes were pretty brutal, even though they were obviously not real... I hope) and Aaron and Hector abandon Kenny. With nowhere else to turn, Kenny pulls out his cornrows and interrupts a Charros practice to announce his arrival on the team. He does this in the typical Kenny Powers fashion by grandstanding about himself and breaking the glass of the announcers' booth. And while the manager seems reluctantly excited to have him, you can't say the same about Kenny's new teammates. But is all of this an attempt to continue on his comeback trail? Or is he really trying to save his soul, for lack of a better term? His dinner with his neighbor's (Efren Ramirez) family brought out the softer side of Kenny that we only saw on brief occasions in Season One and it was a nice little moment. But Kenny's middle finger-waving ego is always simmering just beneath these nice moments and his true redemption seems farther away than ever. I didn't mention Ana de la Reguera as Kenny's new love interest, but I greatly enjoyed her Spanish cover of Bob Seger's "Night Moves." I also greatly enjoyed her tight red dress. But a new love interest hasn't completely wiped away Kenny's love for April, as evidenced by his desecration of her picture in his yearbook. Kenny has been using Stevie's identity (and ATM card) while "on the lam," but I don't think it will be too long before we see his old sidekick (who is now working at Starbucks and dying for a break) make an appearance in person. Kenny's hates: soccer and computers. 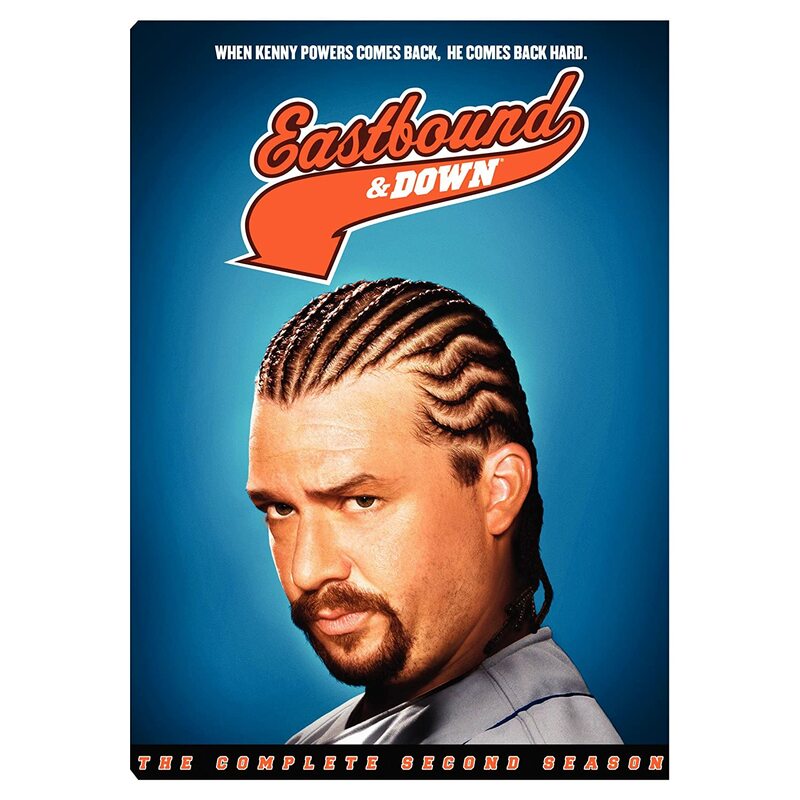 Video: Eastbound & Down, "Chapter 7"